Here it is, as promised – a little later than I had hoped for but better late than never! Please find the full project description of the forthcoming The Art(s) of Slow Cinema VoD platform in the link at the end of this post. In the end, very much depends on the films I’m receiving and how many films I’m receiving. I would therefore like to renew the Call for Films, in case you haven’t seen it yet. You can find the full project description here. Please read this if you’re interested in taking part in this VoD platform, and get in touch if you have questions or even films! If the film’s title were a question about the direction of the filmmaker, then I would respond to it with “higher and higher”. Where Are You Going? is Zhengfan Yang’s second feature film. His Distant was a true marvel to watch and his second one is even stronger. Visually, it is very different from Distant but narrative-wise I would say it is stronger, cleverly constructed and even though you’re driving through Hong Kong for over two hours, your attention will not wane precisely because Zhengfan uses the frustration principle for the creation of revelatory moments, which make you want to watch more. Where Are You Going? is an apt title for a film, which puts you in the seat of a taxi, or a bus, or anything on four wheels that takes you from A to B. The standard first question a taxi driver asks you becomes a metaphor in Zhengfan’s film, though. The film is not only divided into several car journeys across Hong Kong. I found that, more than anything, the question was metaphorical for where the characters (want to) go in their lives. Who are they? Zhengfan doesn’t show them. Sometimes we’re not even sure whether there is someone with us in the car which is travelling through the night or through the busy streets of Hong Kong under the sizzling sun. Their voices are the protagonists. The characters become a face only through their voices, and those voices create not only a personality but an entire life of that personality in front of your eyes. You cannot see the character, but you get to know him/her in an astonishingly detailed way. Every character has a story to tell but only reveals pain, frustration, anger and sorrow slowly and gradually over the course of a long-take. The viewer gets a glimpse of Hong Kong society through the eyes of people from very different backgrounds and social status. There is the young female banker, who is confronted by her taxi driver over her alleged false promises to her customers that they would make lots of money by investing in risky bonds. He himself was cheated out of 2 million HKD by someone like her, he says. While this could be a straightforward black-and-white story, Zhengfan portrays a banker who pursues the job she doesn’t like only to pay her bills, earning, in effect, less than than the taxi driver and being under persistent pressure by her boss to sell bonds. If she fails to sell a certain amount, she’d get fired. We get to know a mainland Chinese couple who wanted to leave the mainland behind in order to search for a better life. A very impressive dialogue between husband and wife, a dialogue that speaks of homesickness and the frustration of discrimination in Hong Kong. While she has enough of trying to get on her feet in the big city (going as far as saying that her “better life” means that she reaches the wall when she stretches her arm out, implying they’re living in a tiny apartment), he is willing to sit this out for another two years, after which they would get a permanent residence permit. She’s dreaming of Canada or Australia; he worries that their parents will consider them a failure if hey returned to mainland China. Pressure from all sides – this is a common theme in pretty much all conversations we hear in the film, be it pressure in family, in society, amongst friends; it’s everywhere. And while the voices in the background speak of saving money, hating the city, childhood memories, or being set up with a man from mainland China, the images take us through Hong Kong. Zhengfan makes sure to give us as elaborate an image of the city as possible. There’s one chapter, whose name I cannot remember now. I can only remember that it contains the word “corridor” and it was so fitting. A rather narrow motorway leads us through run-down houses, houses in desperate need of repair, houses you wouldn’t want to live in, but which at the same time are most likely the most affordable housing there is in Hong Kong. So while you have the motorway so close to your window that you can almost touch the cars, you have the neighbouring tower just as close. It’s a take that gives you a real feeling of the claustrophobia in the city. At the same time, you see at the horizon all those skyscrapers that we know of Hong Kong; the offices, the expensive apartments, the stuff only rich foreigners can afford. Where Are You Going? tells much, much more, and if you’re really attentive, you can see certain connections between the characters. Not all of them are unrelated. Zhengfan has added some connections in there, which makes the entire journey through Hong Kong city, its society and its people even more enriching. The idea of spending over two hours in a car driving through the city is perhaps not very appealing. But the concept is fascinating and riveting in a special way. You see nothing but the streets and other cars, and yet the film is full of humanity, of emotion. You may find this an odd thing to say, but Where Are You Going? is a film which makes you see if you open your ears. P.S. : Very attentive viewers may find a place where Tsai Ming-liang’s Walker went! Guernica magazine has published my interview with Lav Diaz today, which I conducted in November 2015 during the retrospective of his work at Jeu de Paume (and later the the Cinematek in Brussels). Here’s an extract of it. You can read the full interview on their website. Happy reading! Guernica: What was the social and political situation in the Philippines at that time? Lav Diaz: There is an extension to what happened during the war, when the Japanese rampaged us for four years. The Filipino guerrillas became the core movement: [during WWII] they were called Hukbalahap, the Philippine Army against the Japanese. The communist movement in the country started with the Hukbalahap right after the war. They were called Huks. Then we were under the American system. They gave us this so-called independence in 1946, but we were still part of the Commonwealth of America then. We were part of their imperialist movement. Guernica: Did you witness any of those communist fights? Lav Diaz: Not in our [region]. My father was a socialist, but he didn’t join the armed struggle. He was more into the cultural part—education, he focused on that. He didn’t want any violence, so he volunteered there to educate the indigenous people. It was actually very blissful in that area until the fight between Muslims, Christians, and the military in the late 1960s. Although there was this stark poverty and struggle, it was idyllic before then. Education was the center of everything. People were trying to help each other. Roads were being built in the area. I was growing up in this barrio when martial law was declared. Guernica: Mindanao has appeared in your films—for instance in From What Is Before. Do you have any specific memories of your life there? Lav Diaz: Everything that you see there is from Mindanao. From What Is Before—you know, the shoot was hard. But the writing, the creation of the characters, the situations—it’s all from memory. It’s a composition of so many characters, from my parents, from my youth. I just put them together and created a narrative around them. It’s easy to create a narrative for me, because I really know the characters, the locale. Read the full interview on the website of Guernica Magazine. I’m not sure where to start with this one. Not considering the content for a minute, the new and very first edited collection on Slow Cinema, aptly titled Slow Cinema appears like a bit of a fraud. A subject that has been carried by film viewers, lay film critics, and PhD students, is now appropriated by professors of high reputation who have little to do with the subject, meaning I don’t think they have expertise in the subject. A friend of mine also went through the list of contributors and said that the choice of authors made little sense. Unless, of course, you want to attract buyers who see that this book was written by professors of high standing. This method usually works. I reckon that this is also the reason to include the great Jacques Rancière, who didn’t have to be in the edited collection. His book on Béla Tarr is by far better than his chapter in the Slow Cinema book. It is ironic, and to me it says a lot about academia and academic publishing, that a book about a subject carried by lay people has the highest amount of professors in the list of contributors I have ever had in my hands. And I really mean professors. I don’t mean lecturers. Given the work that has been done outside academia, this collection is a slap in the face to everyone who worked very hard on bringing the subject forward. Where are those PhD students who studied the subject for years and brought real innovation to it? I miss a student from my university who submitted an abstract for a chapter which would have dealt with cinematic slowness in North African cinema – a real novelty in the current geographical foci in Slow Cinema research. Where are those writer-filmmakers (like Erik Bordeleau)? If you are familiar with the subject and look through the list of contributors and contributions, you will notice that the official “Call For Papers” which was published a couple years ago was no more than a nice gesture but there was little intention in bringing together experts on the subject or in creating something new. The aim was to be first and not necessarily good. At the same time, it looks as though most of the contributors have been determined in advance, but only for their names, not for their long and close research interests in Slow Cinema…which, as I said, made the CfP pretty much redundant. If you have read Jacques Rancière’s work on Béla Tarr, you don’t need to buy this book. If you have read Song Hwee Lim’s book on Tsai Ming-liang, you don’t need to buy this book. If you have already read Karl Schoonover’s work on Slow Cinema and the labouring body, you don’t need to buy this book. If you have read Cecilia Mello’s work on Jia Zhang-ke, you don’t need to buy this book. Nor do I believe that the almost static films of Andy Warhol (Sleep) should be subject in a book on Slow Cinema. Justin Remes has done well reading those films in his book Motionless Pictures, but Warhol should not be in a Slow Cinema collection. I could go on. After three years of research into the area, I have found myself whispering “I read this somewhere before” (and not necessarily by that specific author) a couple of times, and if you have followed this blog and read through some of my bibliography, which I update regularly, this book is nothing new to you. The monographs which are out there – as mentioned about Béla Tarr, Tsai Ming-liang, or even Tiago de Luca’s Realism of the Senses (2014) – are a great deal better. Thankfully, the price of the book has dropped by now and it has become affordable. Nevertheless, if you’re a Slow Cinema afiniciado you should check out the monographs which exist out there already and keep reading material by lay film critics. With the hundreds and hundreds of reviews, blog posts and other material this edited collection failed to make a real contribution. One exception is once more Philippa Lovatt’s work, who is probably the only person out there who’s actively working on sound, which is always a refreshment because Slow Cinema is primarily discussed in terms of time and its visual aspects. Sound tends to be neglected. Besides, she writes about a director who has not yet been written about in all details: Liu Jiayin (Oxhide I). The book’s most remarkable achievement is its complete neglect of this website. Harry Tuttle’s is in there. David Bordwell’s is in there. But no mention of The Art(s) of Slow Cinema (to be fair, the website is in a reference but only because I have uploaded a paper of mine, so my paper is quoted, not my website). This isn’t a personal thing. It is simply strange that there’s a website – I’d say perhaps the website on Slow Cinema these days – which the editors are aware of (I submitted an abstract and mentioned the website in my biography, besides if you look for Slow Cinema on Google my website comes 2nd after Wikipedia), and it doesn’t even get a mention. Given the contributors I can only imagine the reason. It’s not that it’s a blog. It’s a blog by someone who didn’t have a PhD at the time. In itself, this is disappointing because this website has done a lot to bring research forward and to open up the Slow Cinema canon. What bugs me is that quite a few of my ideas from this blog appear in the book’s introduction with no reference at all. Now, you could say that I shouldn’t have made my thoughts public. But that isn’t the point I’m arguing about here. I do not own my ideas because there certainly are other people who have the same ideas on the same subject. To me it’s frankly a matter of decency and part of research ethics to cross-reference each other. I did so in my PhD thesis. I thought I had a fantastic idea but a few weeks after I had written down my ideas I found a text which, scarily enough, was even written in almost the exact same matter. These things do happen. But I referenced the student’s work because of decency and ethics. As I know that the editors are aware of this blog and that, if you research Slow Cinema, you land on this website almost by default now (which I’m proud of), this looks to me like a deliberate exclusion for whatever reason. This isn’t ethical research and summarises my experience in academia for the last three years. The ideas someone celebrates himself for has perhaps its origins here, so please keep this in mind when, or if, you read this book. Having read this book made the entire business of film distribution and a VoD service much stronger and, personally, necessary because after those now six years following Slow Cinema and seeing the academic development, all I can say is that it’s time to get out of there and do something that is useful for the filmmakers and the films and not for my reputation as an academic, scrambling for a piece of the slow cake. That said, if you’re a total beginner in slow films, this collection may be worth buying. If you have followed the subject for years, then it is not worth at all unless you want to read something you have already read several times before. It’s a real shame that this collection turned out like this. But once I heard which abstracts had been rejected (all of which promising and really unique), I could guess what the agenda of the book was. The final product shows exactly that. For the last couple of weeks, I’ve been toying with the idea of setting up a VoD platform entirely dedicated to slow films, which are not available on DVD and whose festival presence is limited. I’ve been getting more and more questions as to where I’ve seen specific films and I have always been lucky enough that directors have provided me with screeners. I would like to extent this generosity in a way. The plan of a VoD platform is now concrete. I’m working on a project description with which I will contact certain filmmakers in the next couple of weeks. The aim of the platform will be to show hand-selected slow films from directors who have not yet secured DVD distribution or whose films are not yet showing in cinemas. The idea is to bring more unknown slow films to people who are interested in them (and there really is a niche audience for it), and, at the same time, to allow directors to promote their films through this platform. There’s also the idea of connecting the VoD platform to DVD purchases which could be done through the website. This means that The Art(s) of Slow Cinema is, as I’ve always envisioned it, very slowly moving into film distribution. You may have obvious and legitimate questions. The project description will hopefully answer all of those once it’s being made public and directors have approved it. It is, of course, a financial issue, so I’m also working on a financing plan as to how to get the most out of the platform because I want that the returns not only cover the costs of the whole infrastructure, but that the directors receive money which, in the end, flow back into their new film projects. I’m hoping to have a solid project plan ready by February and that the first directors can be contacted then. Overall, the plan is to have VoD service up and running – if only in a small version in order to test certain issues – by the end of 2016. Let’s bring those beautiful slow films to the world! The last day in the life of an elderly man – this is the entire premise of Michel Lipkes’ wonderful debut feature. Once more, I have to bow to the sheer quality of Mexican slow films. There seems to be a real hub for it over there and I begin to wonder whether it would be good to study them separately, not so much as part of Slow Cinema, but as a specific form in Mexican cinema. Leaving the cinematic slowness behind for a second, and just see those films as an output of Mexican independent cinema. Malaventura is a very meditative film. Lipkes has an eye for cinematic beauty in his shots, and the film is thus interspersed with wonderfully photographic frames, which are simply lovely to look at. They help to generate a contemplative atmosphere, to slow down the pace of the film, and thereby give the film a real feeling of its showing the last day of a man’s life. Several frames have a dark, and perhaps sinister nature to them. Some scenes certainly reminded me of Béla Tarr. In an extended scene shot in a local bar, several people are seen drinking and playing cards. A woman takes care of her finger nails. The very characteristic of this scene creates a mysterious feeling. Is what we see actually real, or is the old man merely imagining it? Voice and sounds don’t fit the images we see. The shots have a certain grey tone to them. Smoke is hanging in the bar. The camera moves between faces of gambling men. 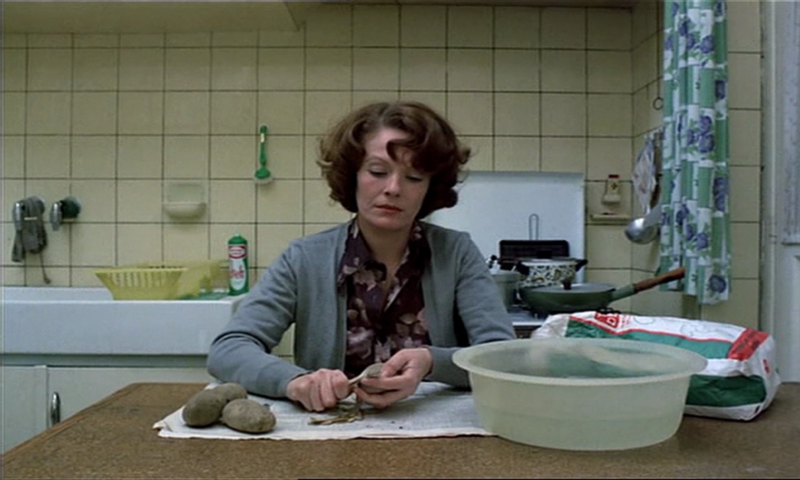 The entire set-up is similar to those famous Béla Tarr pub scenes, especially those in Sátántangó (1994), or even in The Man from London (2007). Indeed, the pub/bar scene in the latter is rather different, but you can definitely see a degree of influence of Tarr on Lipkes’ filmmaking. Perhaps this is a coincidence. Then again, Tarr seems to be everywhere. I think he’s been a huge influence on several directors I’m speaking about on this website. In many scenes, the man, who appears small compared to the city’s vastness, is seen walking from one point to another. It is not clear at the beginning where he is going or whether he has a destination at all. I thought at the beginning that he was just walking. But he does actually walk to a very specific place, which becomes important at the end of the film. It is unclear what the man is really up to. It’s a clever way of constructing the film because the viewer is left wondering what it is that s/he is actually observing. First of all, the man seems to walk to an unknown destination, if he has one at all. Then he is also seen in a park, selling balloons; a sad image, the small man in a long shot, the colours of the natural surrounding degraded in the editing processes, but the colours of the balloons in their full beauty. The contrast between the suffering, stooped, even almost lifeless man on a bench and the colourful balloons flying almost free above the man’s head, in the sky, a sky that promises freedom, is startling. Precisely because this is such a startling contrast, this was also my favourite shot. Lipkes certainly created a simple image with a lot of possible readings. There is nothing much you need to think about. It isn’t a complex image. It doesn’t appeal to the intellectual mind. It just wants you to see what’s there. Lipkes’ film is rather short. With only 67 minutes it is one of the shorter slow films I have mentioned so far. But this is, I have to say, it’s strength. Lipkes has used those 67 minutes to create a very strong portrait of a dying man, going about his seemingly daily life. It is an even more astonishing work because it is a debut feature. I’m sure that Lipkes has a promising future ahead of him. I’m looking forward to his next film! How I had missed this fight inside my head of what is slow and what isn’t. Jenni Olson’s deeply personal, moving and engaging film The Royal Road (2014) started those evil voices in my head again. I think I’ve been saying for a few years now that Slow Cinema is not a fixed but rather a fluid category of films. And yet, I start to find myself figuring out what I consider Slow Cinema and slow film. The former to me is most definitely narrative, while the latter can be anything but is mostly experimental. It doesn’t necessarily need a narrative. This is as vague as I can describe the voices in my head. I thought I would get away with this “definition” but Jenni Olson did a good job in questioning even this attempt of where to position certain films. Is The Royal Road Slow Cinema or a slow film? Is it both (gosh this becomes complicated now)? I don’t want to make a case for either, though. It’s a great thing when I come across films that make me rethink my own writing. In the end, this is what it’s all about and I do not want to be definite on anything. There are millions of films out there. Any fixed definition would fall apart sooner or later. Slow Cinema or slow film, Olson’s The Royal Road is something entirely new for me. It goes very much into the direction of James Benning, whose films – shame on me – I still haven’t had time to see. Her film consists of several static shots with at times only little movement in the frame. This does sound like the now famous Slow Cinema, and yet it isn’t. The shots in themselves are of several different locations throughout America along The Royal Road. There are no protagonists as such in the frames. The visual protagonist is this famous road of which we learn quite a bit through Olson’s personal interest in history. She takes us on a journey through history, which I, personally, found fascinating. Not only because it was history I didn’t know about, and I reckon most Americans don’t know about either. Even the Royal Road is now broken up into several different highways and city streets. I guess so is the knowledge of the road’s history. What makes Olson’s journey along this road really fascinating is her combination of historical blurb with the most personal details of her journey to her loved one – along this very road. It is a journey which expands by the minute. It is also a journey which becomes more personal by the minute. The Royal Road‘s auditory protagonist, to me, is herself and her wife, whose first encounters she describes in a sort of dreamy, blissful tone. It sort of reminded me on my own very long, eight hour train journey across an entire country to see my partner. All those anticipations, those expectations, and anxieties – they’re all there in Olson’s film. Returning more to the visuals, the long shots Olson uses reminded me of a photo album. A sort of photo album that is passed along generations. It doesn’t contain the most beautiful shots but they tell a story and this story comes through the voiceover. It is like sitting down with Olson who shows you one photo after another and who talks a bit about the history or the context of what we see. Or, perhaps, even of what we don’t see. This form of story-telling made me feel part of the film, made me feel part of the journey. It all fits in with the very personal tone of Olson’s film. I felt immensely privileged having seen the film. I felt privileged to go on a journey with Olson to see her partner. The theme of LGBT is not as overt in slow films as it is perhaps in others (maybe I speak rubbish here but my excuse is that I’m not at all familiar with this field). You do have Tsai Ming-liang’s films, of course, and The Royal Road could not be more different from Tsai’s films. Olson does not create a secretive, fictional narrative about her love to Julie Dorf, her wife. On the contrary, she puts it straight out there which makes me film even more personal. It’s a fascinating piece and I would like to see more of Olson’s work in future. I love her interest and fascination with history, and her style – this slow, meditative photo album style – is intriguing and gives me something new to think about in future for whatever entails Slow Cinema. Or slow film. Or whatever you may call it.